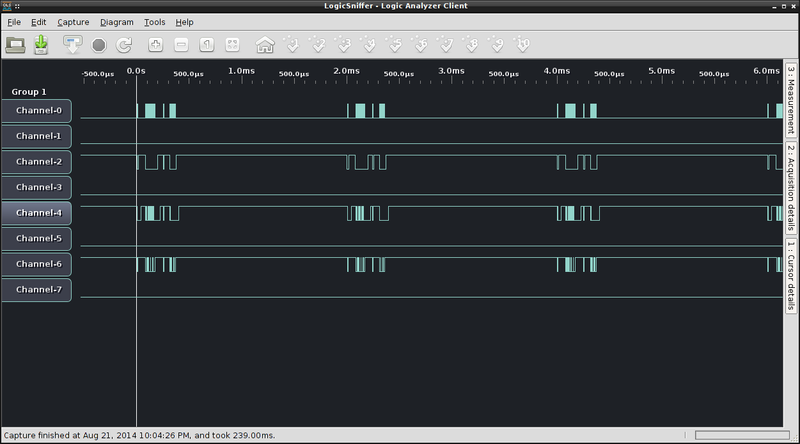 [00:09:19] <jepler> just looking at a few reps of those two transactions, the level translator seems to be working up to 33MHz but not at 40MHz. [00:11:36] <PCW> Well jolly good! [00:54:28] <PCW> wheres the 75 usec from? is that because you are using the kernel driver for the SPI? [00:56:56] <seb_kuzminsky> jepler: is spidev_set_mode() a macro? [02:49:26] <jepler> hm2/hm2_7i43spi.0: error recover successful! [02:50:40] <jepler> This Message will only display once per session. [02:50:40] <jepler> Run the Latency Test and resolve before continuing. [02:57:41] <jepler> but who wants a 2ms servo rate? [02:58:13] <seb_kuzminsky> increase the watchdog timeout for now? [03:09:10] <skunkworks> that looks like it should run at 1ms - right? [03:12:53] <jepler> This Message will only display once per session. [03:12:53] <jepler> Run the Latency Test and resolve before continuing. [03:13:04] <jepler> I think the realtime is dodgy, this happened again. [03:13:42] <jepler> skunkworks: does that even do anything on an arm? [03:15:09] <pcw_home> does the latency test have reasonable numbers? [03:20:08] <jepler> PCW: before sleeping, it checks the current time. If that's later than the target time of the next period, a realtime delay is logged. [03:22:06] <pcw_home> is halscope working? [03:31:24] <jepler> it was still good progress! [03:34:11] <CaptHindsight> if the file /dev/cpu_dma_latency exists, open it and write a zero into it. This will tell the power management system not to transition to a high cstate (in fact, the system acts like idle=poll) When the fd to /dev/cpu_dma_latency is closed, the behavior goes back to the system default. [03:37:18] <memleak> jepler, does -ffreestanding imply -fno-builtin-sin/cos? [05:01:10] <memleak> well it did, now its not doing anything. one moment..
[13:14:08] <jepler> pcw_home: so you think I should put 82ohm series termination resistors on all the outputs (cs/, clk, mosi) and no termination on miso? [14:16:23] <jepler> CaptHindsight: I haven't done much with 2mm headers, is it typical that they are a much looser fit than the .100 headers I'm used to? [14:26:34] <memleak> any idea why latency-test and RTAI testsuite show two completely different latency results? [14:27:01] <jepler> memleak: we've talked about various reasons, want me to review the ones I know about? 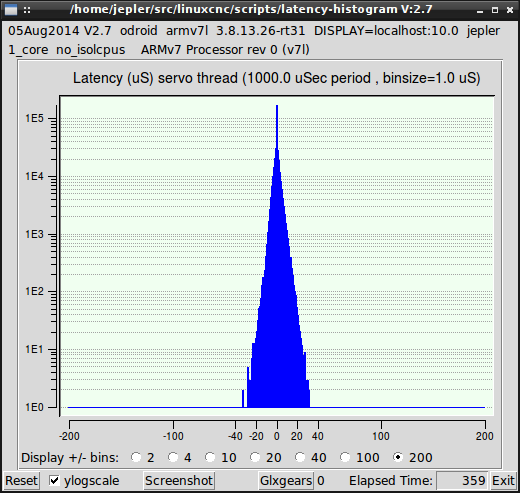 [14:28:15] <jepler> * rtai kern/latency measures "actual time minus nominal time", while linuxcnc latency-test measures "(this time - last time) - nominal_time"
[14:29:40] <jepler> in linuxcnc, we should probably change our latency-test to use (actual - nominal) like kern/latency, except rtapi has no API for "get nominal time of this thread invocation"
[14:32:11] <jepler> except for how it interacts with isolcpus=, why should any choice of CPU be different than another? [14:32:56] <memleak> thats what im wondering. it shouldnt matter. maybe its one of the other two reasons. [14:33:29] <memleak> how difficult would it be to make it measure latency the same way and run on two threads? [14:46:15] <jepler> where do I get 0.5mm square stock? [14:53:32] <CaptHindsight> do 0.64mm pins fit in to the sockets? [14:54:31] <cradek> can you just use appropriate gauge copper wire cut to length? [14:58:00] <CaptHindsight> can you temp the board in place using hot melt? [14:58:08] <jepler> don't want to! [16:14:19] <jepler> pcw_home: and I don't terminate MISO / 7i90's SPIOUT simply because I'm not the driving side? [16:19:52] <jepler> how does that calculation work? [16:44:24] <jepler> you mean to use 5V as the reference, or to power the regulator? [16:52:21] <jepler> this is confusing: "During operation, ensure that VCCA <= VCCB at all times. 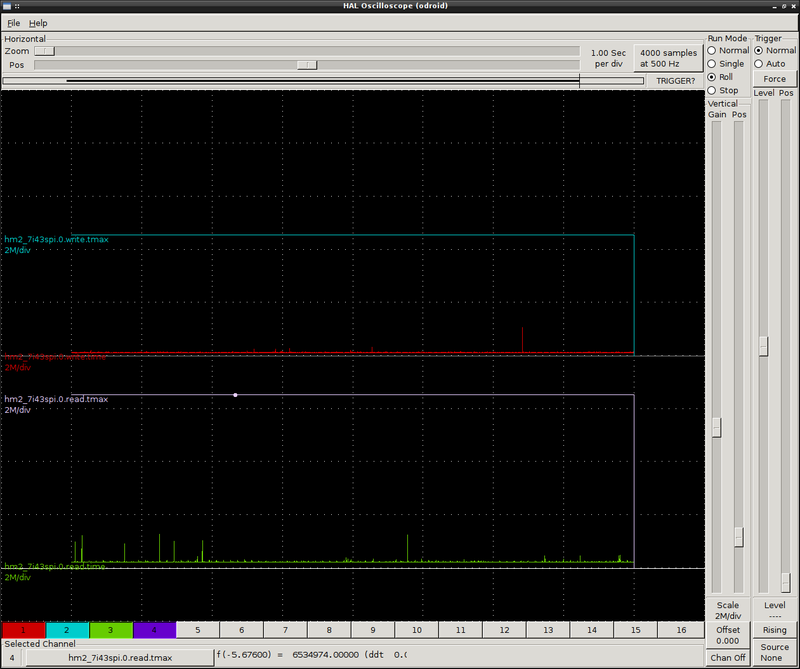 During power-up sequencing, VCCA >= VCCB does not damage the device, so any power supply can be ramped up first. [17:10:41] <CaptHindsight> what is between the header pins on the 7i90 and the FPGA pads? just copper? [18:10:56] <jepler> is there a more sensible way to draw the u3 connector's symbol so that it's understood as the source of the 5v and 1.8v supplies? [18:12:11] <jepler> put it on the side instead of the top? [20:43:50] <jepler> has anyone but me started having the experience that "internal" flickr links don't work the first time, but clicking them again works? 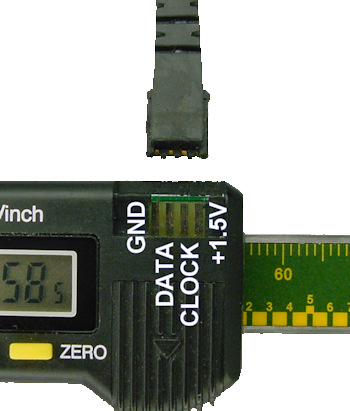 [20:51:37] <jepler> these cheap digital calipers have? [20:52:07] <kwallace> It looks like the narrow lines are grouped 1,5,9... 2,6,10... 3,7... and 4,8 so maybe quadrature sensing. [20:55:10] <Tom_itx> jepler got in late.. what do you want to do with the data from the calipers? [20:55:54] <kwallace> The link isn't to my board. I'll link it in a minute. [20:56:47] <jepler> not great for positioning! [21:03:36] <kwallace> The test pads at the top may be for serial, maybe. I'll have to check with an o'scope. [21:13:22] <kwallace> Unfortunately, they were shipped with all the calipers in one bunch without any padding between them, so the displays got damaged more. [21:16:44] <kwallace> I did get three fairly good ones out of the bunch. 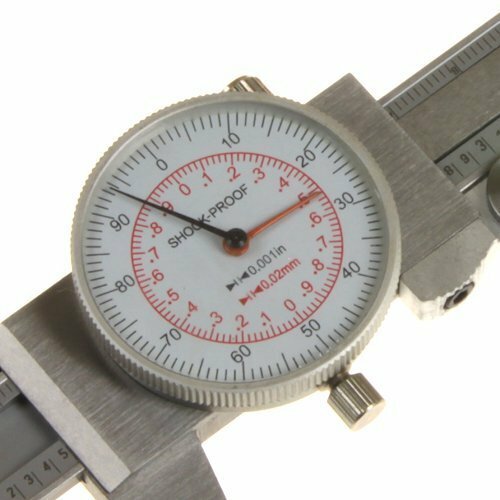 I have some nice dial calipers I normally use but they are all in inch and I am using metric more these days. [21:27:46] <kwallace1> I got these calipers "by mistake". They will probably take up too much of my time. [21:36:19] <jepler> the mounting holes actually measured 3.35mm, I guess that's a clearance hole for an M3 screw. 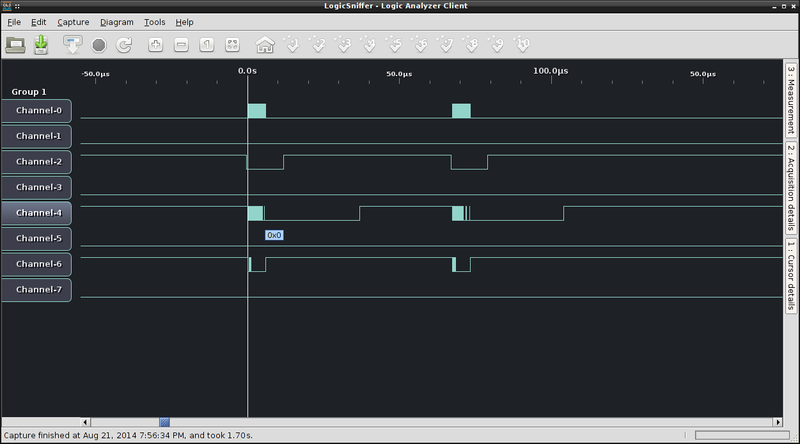 [21:36:51] <jepler> I haven't let the latency test run for even 10% as long as I let hm2_spi; that's a good point. [21:37:05] <jepler> it'll tell me if it's SPI or "just anything"
[21:44:35] <jepler> it's sensitive to its clock, then? [21:46:45] <jepler> another monstrosity in d8? [21:49:15] <jepler> still 16-bit instructions? [21:56:50] <jepler> hey wait, did you just call me crazy? [21:59:21] <PCW> how much I/O stuff is available on the Odroid? [21:59:53] <jepler> PCW: not much. 3 GPIOs, 2 serial ports, and SPI. [22:00:24] <PCW> is there decent documentation of the SPI hardware? [22:01:32] <jepler> PCW: I found a register-level document about it, but it's pretty opaque. and of course there's the kernel source itself. 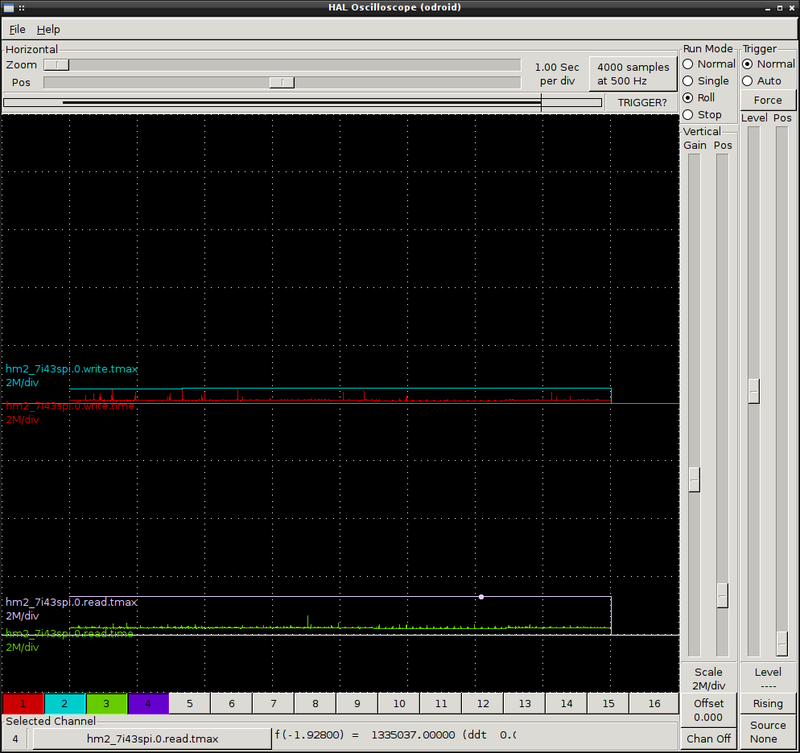 [22:02:29] <jepler> PCW: it's an inexpensive device that lets you show that the SPI works? [22:05:49] <PCW> what kind of numbers do you get with the latency test? [22:16:25] <PCW> is this all power related? [22:27:16] <jepler> how well do you require that it work? [22:30:07] <CaptHindsight> anyone have an imx6 board with a PCIe slot? [22:35:50] <CaptHindsight> PCW: do you see any issues getting a http://www.imx6rex.com/ with a PCIe-mini to PCIe adapter to the 6i25 to work? [22:38:14] <CaptHindsight> anything x86 specific in the drivers? [22:41:33] <PCW> ok resolver code patched, but will it blend?